John Blackwell has been involved with the club for many years, helping with the coaching and running the reserve team in the seventies, as Club Secretary from 1978 onwards and as General Manager from 1998 until he retired in May 2016. He has even been on the substitute's bench three time for the Pilgrims. 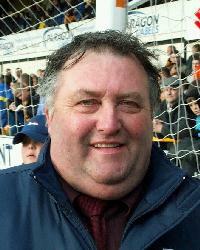 Following his retirement he was appointed as Club President. He was a member of the Vauxhall Conference Management Committee for nine years and the Unibond League Management Commitee for five years. As a youngster he started off as a goalkeeper with Tower Road School and Kitwood Boys School. He played in successive Pitcher Cup final victories for Kitwood, the first as a keeper against George Farmer, the second as a striker against Sleaford. His prowess at junior level won him a trial with Peterborough United, but he decided to play locally, first with Boston Athletic, then Real Towell. His biggest disappointment is that he was not good enough to play football at a top level. The match he most remembers is the FA Trophy semi-final against Altrincham at York Street back in 1985. In his leisure time he enjoys watching sport on TV, reading the Saturday evening football papers and being with his family. Previous clubs (as manager): Shaw Lane, Glasshoughton Welfare, Ossett Town. 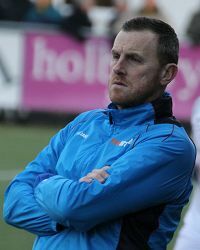 Craig Elliott was appointed manager of Boston United in November 2017. Having guided Shaw Lane to three promotions in four seasons with the Barnsley-based club, Elliott stepped up to become Adam Murray's permanent successor at The Jakemans Stadium. He had previously managed Glasshoughton Welfare and Ossett Town, having retired early from his playing days due to injury. Previous clubs: Sheffield United, Alfreton Town (loan), Bradford Park Avenue (loan), Matlock Town (loan), Stalybridge Celtic, Gainsborough Trinity. 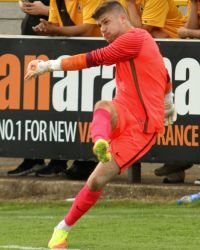 Goalkeeper George Willis joined Boston United in May 2017 after opting to turn down the offer of a new contract with league rivals Gainsborough Trinity. The former Sheffield United youngster progressed through the Bramall Lane system before spending various spells away on loan. 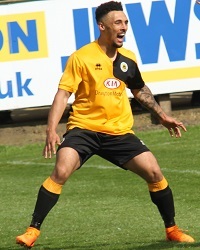 Dylan Parkin linked up with Boston United in the summer of 2018 following his release from National League newcomers Chesterfield. Parkin was a regular on the Spireites’ bench in 2017-2018, although he did not make a senior appearance at the Proact Stadium. He signed an initial one-year deal upon joining the Pilgrims. 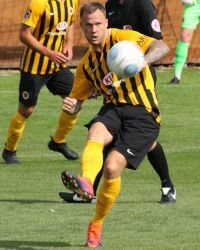 Ben Middleton joined the Pilgrims on an initial month's loan from Harrogate Town in December 2017. The defender, capable of playing at right-back or centre-half, emerged from Doncaster Rovers' youth set-up to make numerous appearances for North Ferriby United and Scarborough Athletic before a move to Harrogate Town in the summer of 2017. He had also spent a brief loan spell with Buxton prior to his arrival in Boston. 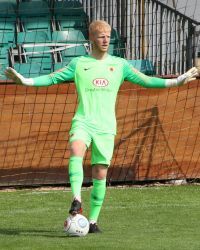 After being recalled just days into his second month with the Pilgrims, Middleton returned for a fresh loan spell in March 2018. He signed permanently in the summer of 2018. Previous clubs: Huddersfield, Guiseley, Buxton, Farsley Celtic, Hyde United, Shaw Lane. 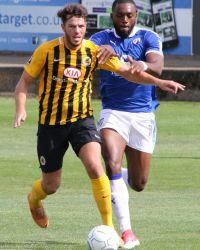 Tough-tackling midfielder Spencer Harris began his career at Huddersfield Town and arrived at The Jakemans Stadium in June 2018 following a successful two-year spell with Craig Elliott’s former club Shaw Lane. Harris scored close to 40 goals during his two campaigns with the now-defunct Evo-Stik League club and helped the Ducks reach the Emirates FA Cup first round in 2017-2018. Jay Rollins joined the Pilgrims in the summer of 2015 after impressing in pre-season trials. He was voted Player of the Year in 2016/17. Previous clubs: Hull City, Gainsborough Trinity (loan), Harrogate Town (loan), Cambridge United (loan), Tranmere Rovers, Stockport County (loan), Altrincham (loan), Southport (loan), Lincoln City, Scunthorpe United. The Pilgrims completed the eye-catching acquisition of striker Jonny Margetts from Scunthorpe United in July 2018. Margetts had spent close to two seasons at Glanford Park following an August 2016 deadline day move from Lincoln City, where he had opened the 2016-2017 campaign with five goals in 10 appearances. He began his career at Hull City and excelled during various loan spells at the likes of Gainsborough Trinity, Stockport County and Tranmere Rovers. 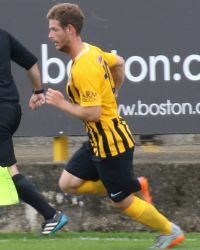 Adam Marriott completed a trio of former Lincoln City signings when he joined the Pilgrims from Royston Town in July 2018. Marriott linked up with former team-mates Nathan Arnold and Jonny Margetts as Craig Elliott added much-needed quality and experience to his new-look attack. 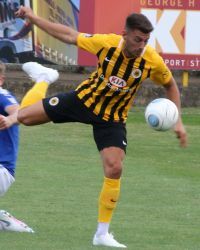 Marriott began his career at Cambridge United and went on to play for the likes of Cambridge City and Stevenage before helping the Red Imps to the National League title and Emirates FA Cup quarter-finals in 2016-2017. Photographs copyright © Ken Fox.